When you think of rugs, silk is probably not the material that comes to mind. Conversely when you think of silk, rugs are probably not the first resulting product that come to mind. The combination is obscure, but very beautiful. Silk can weave light and delicate tapestries, without sacrificing the durability. Many of those you see in museums, have been woven with silk, dating back centuries. There is a reason that many of the silk rugs in museums are on display, but not in use. It’s not the durability that’s the problem, it’s the method of cleaning. Because no matter how hard you may try, at some point or other, you’re going to spill something on the rug. Given Murphy’s Law, it will probably be spaghetti sauce or some other very offensive liquid that is difficult, if not impossible to remove. That’s not to say that cleaning silk is impossible. You know how much the Knox Carpets team loves a challenge, and cleaning silk is a challenge. 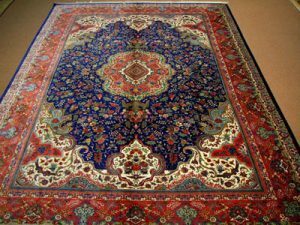 While we don’t offer silk carpet solutions ourselves, we are here to offer tutelage if you already have a silk carpet in your home or business and are looking for assistance cleaning. First- a little background on silk. It’s a natural fiber. It is derived from silkworm larvae. It is prone to losing its flexibility, when it becomes wet. Challenge number one, right here. But don’t let that deter you. First, remove all debris and dust from your silk rug. You can actually use a vacuum cleaner for this part of the process. Alternatively, you can use a broom. Don’t have either on hand? You can manually shake the rug to remove any unwanted particles. Remember the aforementioned spaghetti stains and such? When these occur, you need to tackle them right away. If it’s a solid stain, you are sort of in luck. You can actually pick up a spoon and remove the stain. Just be careful to not move the stain around. Liquid stains are a different beast. If possible, blot with a clean white towel. We also recommend using club soda. Things we don’t recommend? Heaters, hair dryers, chemicals, really hot water, really cold water. Stick with lukewarm water and no harsh cleaning solutions. You want to be gentle with such a gentle fabric. What about the stains that go above and beyond? The smelly ones. Baking soda is your partner in crime here, it absorbs and removes any odors from the fabric. We recommend that you leave the baking soda one full hour on the rug before cleaning your rug using the vacuum cleaner. A lot of this advice is DIY- do it yourself. But for our customers that are wary of being too hands on, there is a brand of silk carpet cleaner that we recommend. It’s called Rug Doctor and it’s gentle, yet effective- the perfect balance. Questions? Give the Knox Carpets team a shout. We’d love to help however we can.